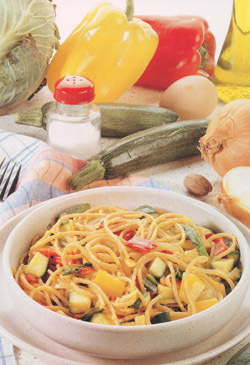 Wash and slice the vegetables; sauté the sliced onion in oil, add the chopped pepper, the cabbage leaf and zucchini. Add salt, cover the pot and allow to cook over 15 minutes. In the meantime boil the pasta. Beat the eggs with a little salt and grated nutmeg. When the pasta is al dente, drain and transfer to the pot with the vegetables, add the oil and the beaten egg and allow the flavours to blend for about two minutes over a moderate heat. Serve with the grated Parmesan on the side.